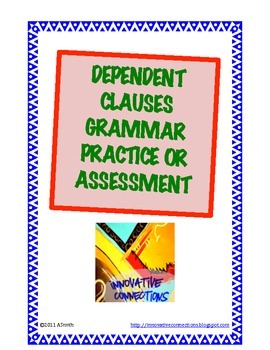 Need a Quick but challenging assessment for your dependent clauses? 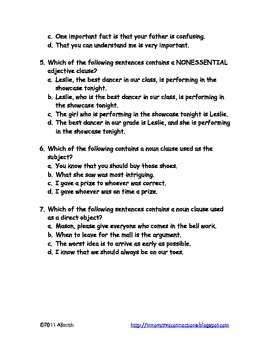 Here is a 10 Question Multiple Choice Test and Answer Key (formatted like the state test for MS); Covers adjective, noun, and adverb clauses,as well as essential/nonessential clauses. The first 3 pages contains test. 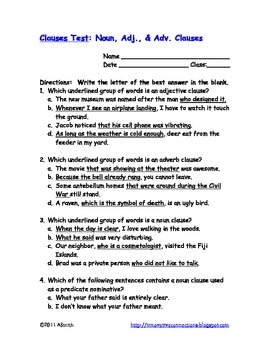 Following pages contain the answer key. Easily assesses whether or not a student can apply his/her knowledge of these skills.